Dame Annette Faye King DNZM (née Robinson, born 13 September 1947) is a former New Zealand politician. She served as Deputy Leader of the New Zealand Labour Party and Deputy Leader of the Opposition from 2008 to 2011, and from 2014 until 1 March 2017. She was a Cabinet Minister in the Fifth Labour Government of New Zealand, and was the MP for the Rongotai electorate in Wellington from 1996 to 2017. The daughter of Frank Pace Robinson and Olive Annie Robinson (née Russ), King was born in Murchison on 13 September 1947. After receiving primary education in Murchison, she attended Murchison District High School from 1960 to 1963, and then Waimea College in 1964. Between 1965 and 1967, she completed a diploma in school dental nursing, and worked as a dental nurse from 1967 to 1981. In 1981, she gained a Bachelor of Arts degree from the University of Waikato, and obtained a postgraduate diploma in dental nursing the same year. She was a tutor of dental nursing in Wellington from 1982 to 1984. She is partly of Sri Lankan descent. King joined the Labour Party in 1972, and has held various offices within the party, including a term on the party's executive (1991–1992). In the 1984 election, she stood as the party's candidate for Horowhenua, and was successful. She was re-elected in the 1987 election. Following the 1987 election, she was appointed parliamentary under-secretary to the Minister of Employment and of Social Welfare. In 1989, she was elevated to Cabinet, becoming Minister of Employment, Minister of Immigration, and Minister of Youth Affairs. She was also given special responsibility for liaising between Cabinet and the party caucus. In the 1990 election, King lost the Horowhenua electorate against Hamish Hancock, a lawyer who stood for the National Party. 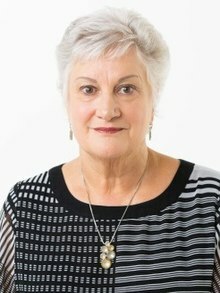 She served as chief executive officer of the Palmerston North Enterprise Board from 1991 until the 1993 election, when she was returned to Parliament as the MP for Miramar. In the 1996 election, when the shift to mixed-member proportional (MMP) representation prompted a reorganisation of electorates, King successfully contested the new seat of Rongotai. In that 1996 election, she was ranked in sixth place on the Labour Party's list. When Labour won the 1999 election, and Helen Clark became Prime Minister, King was appointed Minister of Health. She was ranked sixth within Cabinet. After Labour winning a third term in government at the 2005 election, King took on the roles of Minister of Transport and Minister of Police. Following another reshuffle in late 2007, King became the new Minister of Justice. Before the 2008 general election she was elevated to number four on the party list. Labour was defeated in the 2008 election by the National Party led by relative newcomer John Key. King retained her seat with a majority of about 7,800 votes. King was elected as the Deputy Leader of the Labour Party in a special caucus meeting on 11 November 2008, replacing Michael Cullen. Phil Goff, another senior Labour Party member, became the Leader of the Labour Party, replacing former Prime Minister Helen Clark. King stood again for Rongotai in the 2011 general election. She was ranked second on the Labour Party list. Following the defeat of the Labour Party in the 2011 election, Annette King announced she would step down as Deputy Leader of the Labour party, and Deputy Leader of the Opposition effective 13 December 2011. She was succeeded as Deputy Leader by Grant Robertson in the 2011 Labour Party leadership election. In the 2014 election, King increased her majority in the Rongotai electorate, but National won the party vote for the first time since the initial MMP election in 1996. Labour's heavy defeat at the 2014 election caused the resignation of David Cunliffe as the party's leader and the next leadership election, with King in an interim capacity as deputy leader. Following the election of Andrew Little as the new leader, King remained as deputy in a permanent capacity. Although Little guaranteed that she would be deputy for at least a year, he did not indicate whether he wanted her to be a future Deputy Prime Minister. On 1 March 2017 King announced her intention to retire from politics at the 2017 election, despite initially indicating she would only contest the election on the party list. She also stepped down from the deputy leader role. On 14 November 2018, King was appointed as High Commissioner to Australia by Foreign Affairs Minister Winston Peters. King received both the New Zealand 1990 Commemoration Medal, and the New Zealand Suffrage Centennial Medal in 1993. In 2007, King was awarded a Bravo award by the New Zealand Skeptics for her work along with "industry group Natural Products New Zealand, their attempt to provide standards and accountability via the Therapeutic Products and Medicines Bill." In the 2018 New Year Honours, King was appointed a Dame Companion of the New Zealand Order of Merit, for services as a member of Parliament. King is married with one daughter, and has three step-sons. She is a cousin of former National minister Chris Finlayson, from whom she received verbal abuse in Parliament in September 2013. Finlayson also opposed her in the Rongotai electorate at the 2008, 2011 and 2014 general elections. In 2019 an authorized biography of King was published, co-written by John Harvey and Brent Edwards. ^ New Zealand Hansard – Members Sworn. 651. New Zealand Parliament. 8 December 2008. p. 2. Retrieved 8 October 2014. ^ a b c d e Taylor, Alister, ed. (2001). New Zealand Who's Who Aotearoa 2001. Auckland: Alister Taylor Publishers. p. 515. ISSN 1172-9813. ^ a b c d e f g "Hon Annette King". New Zealand Parliament. 5 May 2013. Archived from the original on 5 May 2013. Retrieved 8 October 2014. ^ a b c "Rongotai: Annette King wins easily". The Dominion Post. 26 November 2011. Retrieved 7 October 2014. ^ "Sri Lankan New Year". Asia Downunder. Retrieved 7 November 2015. ^ a b c d e f g "Hon Annette King". New Zealand Parliament. 22 September 2014. Retrieved 7 October 2014. ^ "New Zealand Official Yearbook 1993". Department of Statistics. Archived from the original on 24 January 2015. Retrieved 7 October 2014. ^ "Part III – Party Lists of Successful Registered Parties" (PDF). Electoral Commission. Archived from the original (PDF) on 8 February 2013. Retrieved 14 June 2013. ^ "Party Lists of Successful Registered Parties". Elections New Zealand. Retrieved 21 September 2011. ^ "Official Count Results – Rongotai". Chief Electoral Office. 22 November 2008. Retrieved 9 October 2014. ^ Gower, Patrick (11 November 2008). "Helen Clark takes foreign affairs post in Labour reshuffle". The New Zealand Herald. Retrieved 8 July 2009. ^ "Labour Party List 2011" (Press release). New Zealand Labour Party. Scoop. 10 April 2011. Retrieved 10 April 2011. ^ "David Shearer elected as Labour leader". The Dominion Post. Fairfax New Zealand. 13 December 2011. Archived from the original on 22 December 2011. ^ "Official Count Results – Rongotai". Electoral Commission. 4 October 2014. Retrieved 9 October 2014. ^ Vance, Andrea (1 October 2014). "Parker, King to lead Labour". The Dominion Post. Retrieved 9 October 2014. ^ Trevett, Claire (1 March 2017). "Labour has lost one of its giants". The New Zealand Herald. Retrieved 1 March 2017. ^ "New High Commissioner to Australia announced". The Beehive. Retrieved 15 November 2018. ^ "Bravo Awards". New Zealand Skeptics. Retrieved 7 November 2016. ^ "New Year honours list 2018". Department of the Prime Minister and Cabinet. 30 December 2017. Retrieved 18 January 2018. ^ "Today in Politics". Stuff.co.nz. Fairfax Media. 26 September 2013. Retrieved 23 February 2014. ^ Trevett, Claire (6 March 2019). "Annette King gives insider's look at the rise of Jacinda Ardern and dealing with Winston". The New Zealand Herald. Retrieved 6 March 2019. This page was last edited on 29 March 2019, at 05:43 (UTC).